The new 9-4X brings unique Saab design and engineering values to the growing, luxury mid-size crossover segment. Distinctive Scandinavian and aircraft-inspired looks are combined with car-like handling and ride characteristics: this is a vehicle which delivers driving and design appeal in equal measure. In true Saab tradition, the 9-4X delivers on its sporty persona. It is configured around a unique, purpose-designed crossover body structure, which has been key to delivering such excellent handling and ride properties. Its car-like driving dynamics can be enhanced still further by Saab’s advanced all-wheel-drive system, Saab XWD, and DriveSense adaptive chassis control. Both are standard with Aero, while Saab XWD is also available as an option. Under the hood, nestles a choice of compact and efficient V6 engines, naturally-aspirated or turbocharged. The 265 hp, 3.0L motor for entry-level and premium variants features direct fuel injection and variable valve timing; while the 300 hp, 2.8L exchanges direct injection for twin-scroll turbocharging and is exclusive to top-of-line Aero variants. Both engines are mated to six-speed automatic transmissions under adaptive, electronic control. The roofline is visually lowered and extended by a rear spoiler integrated into the deck lid. The rear lighting carries forward the signature theme introduced by the new 9-5 sedan. An ‘ice-block’ bar lit by LEDs extends across the lower deck lid and wraps around the light units. Twin rhomboid-shaped exhaust tailpipes are neatly integrated into the lower bumper molding. Overall, the 9-4X’s bodywork is noticeably free from unnecessary decoration or trim. A dark protective appliqué is applied to lower body, but there are no wheel-arch claddings or protective body panels. 18-inch, six-spoke alloy wheels are standard fit, while Aero models are distinguished by 20-inch, nine-spoke ‘turbine’ alloy wheels, as well as bi-xenon cornering headlights and black mesh inserts in the front grille and fog lamp housings. The spacious cabin provides comfortable accommodation for up to five adults and is defined by a signature Saab, driver-focused cockpit layout. The center console, center stack and main instrument display are presented within a single form that sweeps up around the driver. For the 9-4X, this is finished with wood or carbon fiber-effect trim. Other subtle references to Saab’s aviation heritage include a selectable, attitude style speed read-out, green illumination for the needles of the three main dials and traditional Saab ‘joystick’ adjusters for the mesh-style air vents. The ignition – a start/stop button – is, of course, located between the front seats, in true Saab tradition, adjacent to the shift lever. Available infotainment includes two audio options, a seven-speaker or top-of-the-line Bose system with 5.1 surround sound. The optional 8-inch, touchscreen hard disk based navigation system includes a bird’s eye map view and 10 GB storage for jukebox’ music files. Communication on the move is supported by OnStar and integrated Bluetooth hands-free phone system, which functions via voice command and steering wheel controls. In the rear, passengers can enjoy independent climate control, in addition to the standard dual-zone system, and select their own onboard audio/visual entertainment through a dedicated unit in the back of the center console. This optional equipment has a video AUX input and two 8-inch screens in the rear face of the front seatbacks. The trunk of the 9-4X is optimized for space and ease of use. The 60/40 split seatbacks fold down in a single movement, without having to move the seat cushions or remove the retractable head restraints. They provide a completely flat cargo deck, offering a total volume of 61.2 cubic feet. The front section of the trunk floor is hinged and can be opened via an aircraft-shaped handle to reveal additional under floor storage. Floor space can be tailored as required by the, U-shaped track with a telescopic cargo divider, which can be moved to any position to keep items in place. For additional convenience, the deck lid is available with a remotely controlled, hydraulically powered operation. It can open fully, or to a programmable lower position if there is restricted clearance overhead, such as in the garage. 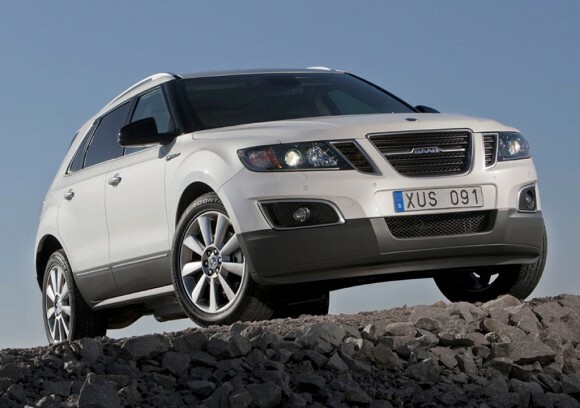 The Saab 9-4X brings car-like handling and ride qualities to the crossover segment. Key to its dynamic performance is a unique body structure, purpose-designed for a crossover application and free from compromises through adapting an existing sedan or wagon format. Advanced driving technologies include Saab XWD, the sophisticated all-wheel-drive system, which infinitely varies drive torque between the front and rear axles. This pre-emptive, light and fast-acting system offers optimized grip in virtually all driving conditions, dry or wet, smooth or loose. It is combined with an electronically-controlled, rear limited-slip differential (eLSD) which can transfer up to 50% of rear torque between the rear wheels, to whichever has more grip. Driver and vehicle in the Aero are brought even closer together by Saab DriveSense, an adaptive chassis function which uses real time damping control to help the 9-4X react to how it is being driven and to changing road conditions. In addition to the default ‘Comfort’ setting, the driver can select ‘Sport’ mode, which introduces a firmer range of adjustment for the dampers, as well as a sharper throttle pedal response and raised gear shifting points. An ‘Eco’ mode also re-maps the throttle pedal and gearshifting patterns for optimal fuel economy. Other driving aids include variable effort steering, a function of Saab DriveSense, and bi-xenon adaptive lighting, which provides better illumination of upcoming bends by linking the direction of the headlamp beam to the steering angle. The powertrain line-up comprises two efficient all-aluminum V6 engines, both with a six-speed automatic transmission. These light and compact, 24-valve motors feature variable valve timing, on both inlet and exhaust sides, and boast power ratings typical of larger displacement engines. The 265 hp, 3.0-liter naturally-aspirated motor is available with front-wheel drive or Saab XWD and includes direct fuel injection. With front-wheel drive, it propels the 9-4X from zero to 60 mph in just 7.9 seconds (8.4 seconds with Saab XWD) and is expected to enable estimated city/highway combined fuel consumption of 20 mpg* (19 mpg* with Saab XWD). Available exclusively in Aero specification with Saab XWD as standard, the 2.8-liter turbo engine packs 300 hp and generates an impressive 295 lb.ft. spread of torque between 2,000 and 5,000 rpm. It delivers zero to 60 mph acceleration in 7.7 seconds and estimated city/highway combined fuel consumption of 18 mpg. The success of Saab’s work is reflected in surveys of real-life collisions by the US Highway Loss Data Institute (HLDI) and the Swedish Folksam insurance company, where Saab cars have consistently scored well, several times being ranked best in their segment. The Saab 9-3 and the new 9-5 sedan are also maximum 5-star performers in EuroNCAP crash safety ratings, as is the 9-3 in U.S. NCAP.